The invention of Coca cola happened in 1885 and Coca cola as a brand has been in the market for more than 125 years and is still going strong. It is one of the brands which is well recognized and accepted. It acts as an icon for the people in America and has grown well as they have the adaptability and ability to capture and retain consumers in all kinds of markets. They have focused very strongly on the area of marketing and brand building. They have used all kinds of advertisement techniques from the time of their inception from print media to face to face interaction and promotion (Murray, 2008, pp.3). The logo has also been widely used for their promotional campaigns. The culture in Coca cola as well as the strategy they follow is centered on marketing which is aggressive. They started by spreading their operational area by tapping markets which were new for them starting from the United States, moving to the Latin countries and then moved their attention to the European market. The Second World War was being viewed by many as a major setback for all industries but Coca cola to the contrary flourished. The threat which they faced by the war was converted into a very lucrative opportunity. The company set up almost 64 plants for bottling their product as the demand was on the rise. The president at the time ordered that the product would be supplied constantly for the soldiers and the cost was not the issue. This helped Coca cola to build a strong base from where they would further carry out expansion internationally. One of the core beliefs of the organization was to supply drinks which were not alcoholic. The organization has supplied soft drinks which are their core product and also subsidiary products like water and energy drinks. Their central agenda is constant growth and expansion. Their focus and plans are very strategically designed. Mission – Their mission is that to would like to provide maximum satisfaction to their consumers and keep them refreshed. The pricing is kept low so that it can be purchased by all kinds of consumers belonging to various income groups (Michael, 2007, pp.21). They are very committed towards quality for their consumers as well as their employees while maintaining their integrity. Their mission is to do one simple thing, “make a difference”. Vision – They want to improve the availability of the product for everyone all across the world. They also envision maximizing the benefits for the stakeholders while providing a stable work environment. The company also aims to keep many options in terms of kinds of beverages under their brand so that various kinds of requirements of consumers can be met. They also work towards environment friendly operations and towards building a huge network of people who work towards its success. Goal – The goals at Coca cola are not only financial gains related ones they are non financial as well. They work in a very organized and planned manner. The financial goals are the obvious ones i.e. maximizing profitability while keeping costs low but the non-financial ones are aimed at changing the image of the company. The company has constantly been under the scanner for being unhealthy and supplying high risk drinks but that is not true. They are using aggressive advertising techniques to get this message across to the consumers and are also aiming at grabbing the market which is coffee reliant in terms of beverage choice. Their efforts are not towards becoming coffee manufacturers but trying to replace it with their energy drinks. Using their advertising messages they are convincing their competitors of how they are better than their competition (Keegan, 2002, pp.150). They want to achieve 100 percent increase in sales in two years and that’s not for their main products but for their products which are not that popular. Inputs – the main input would be the ingredients which are used for the production of the drinks which they offer to their consumers. The type of sweetening agents would depend on the kind of concentrate which is manufactured. The base for each product which they offer is water. As one of their main agendas is marketing their prized assets are their employees and their consumers. Their formula which is the main input is kept a well guarded secret (Valerie, 2008, pp.16). The soda which provides the fizz to the drink is not manufactured by the company but it is provided by external manufacturers. They just make the base syrup and then send it to them. The proportions which are followed are kept a secret as the competitive advantage would be maintained and the taste would be standard for all products which go out into the market. Challenges – The level of operation of Coca cola is very broad. This leads to many obstacles coming up which need to be tackled. Every market they enter into has its own problems and trends which are unique to them. Their strategies have to thus be different for each zone. One example is the growing consciousness with regard to the health aspect. That is where the drinks which met the diet conscious consumers’ requirements came up. This would also involve their research and innovations department to constantly understand the market requirements and come up with products which would meet those demands. 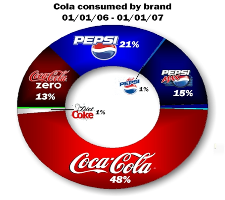 There are multiple markets which Coca cola has entered into. The differences in each in terms of social set up and political situation leads to different strategy requirements for all (Michael, 1998, pp.16). The policies have to be closely studied and decision accordingly made and executed. This also leads to situations where out of compulsion they have to work as per the policies of a country but that is not acceptable to other parts of the world so they get caught in the cross fire. 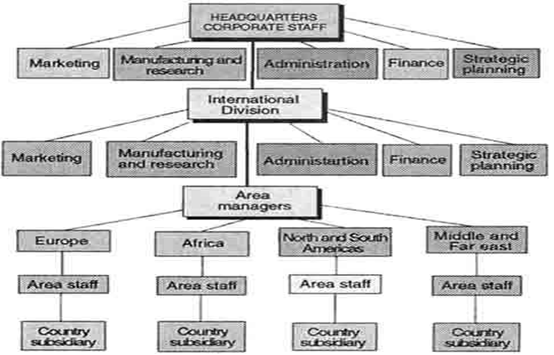 The other grouping is in terms of the regions in which they operate in like European, American, and African etc. This is mainly on the basis of geographic location. This helps as it makes the decision making process faster as the presence of authority is locally available. Any change in demand or market situation is looked into and reacted on immediately so that minimum losses are incurred and maximum benefit can be extracted. The management which is present at higher level can concentrate their attention on planning which is for the long term advantage of the company (Paul, 1996, pp.218). The corporate section of the organization look after the division which is central like Human resource, marketing, finance, research and development and are located at the corporate headquarters as well. A part of these central operations is carried out at the regional offices as well but the crucial decisions are made at the corporate level only. The 2002 decision which was related to the sponsorship for the World was taken by the senior management at the corporate level. The local division in any area would be responsible for decision which is related to advertising in the market as they would be more aware of the requirements as well as the sensibilities of the local people. Coca cola in 2004 was displaying low rate of growth but this was soon going to change with the coming of the new chairman then. The techniques used by him involved use if mechanisms for purposes of integration which were complicated. The top management was divided into teams which would tackle the problems faced by them in a systematic manner. The company Coca cola came into existence in 1888 and was set up mainly to tap the benefits from the popularity of the name Coca cola. Any organization goes through a life cycle which includes the stages starting with birth, then growth, at a later stage decline and finally death. Coca cola at the present time is in its growth stage as it is still evolving and going strong despite the changes happening all around it and in it. Internally it has gone through a lot too. They have faced the constant pressure to maintain labor costs as low as possible despite the demands from the employees constantly growing. The company has seen labor strikes in 2005 when the management was trying to implement a policy which involved the employee to contribute much more towards their benefits related to health (James, 2011, pp.37). At any point of time the company has to face the fact that work stops then the organization will not be able to satisfy the consumer demands and thus in turn losing profitability. Power is good but too much of it is not either and this is what is seen with regard to the company’s board. They have too much of an influence on the happenings of the company. The environmental uncertainty would lead to problems like issues with the suppliers and dealers. When they had launched Coca cola experienced a high level of growth but as it moved along it life cycle it faced many problems which they had to confront and try to come out strong while continuing to grow. · As was seen that the power with the top management was too much it needed to be pruned as it was at times damaging the company. · Decisions related to operations and local decision making was passed down from the senior management to the localized management. This also improved reach and reaction in localized markets. · The management in the corporate set up concentrated on planning which was for long term success and strategically important for the overall growth of the company. · The responsibility for growth was as much with the corporate managers as was with the local ones. · The goals of the organization as well as the employees were kept in mind. · The aspect of bureaucratic behavior was slowly being eliminated and that would help in speeding up the decision-making process. · The debate related to the idea of having a matrix kind of structure or a product team structure is still under deliberation as one is too costly and the other does not fit in because of its present set up. Till the time a decision is reached it continues to be a structure which has many divisional segments.